There is a growing trend within churches today that we’ve got to deal with. It affects all churches without bias – big and small, rural and urban, black and white. The trend I’m talking about is the married woman at church without her husband. More often than not, these ladies are also moms who are bringing their children to church all by themselves. Men are supposed to be making disciples of their children. This trend should be setting off alarms like the church is on fire. And just to be clear, I’m not talking about the husbands and dads who miss several Sundays in a row due to work. I’m talking about the men who you couldn’t pick out of a line up because they are never at church. How can we, as the church, reach those men and minister to those families most effectively? 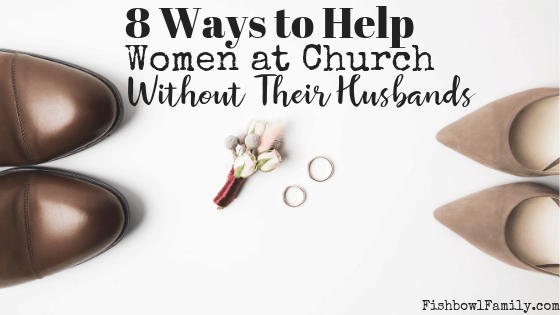 Here are eight ways to minister to women who attending your church without their husbands. As always, the first thing you should do is pray. Talk to God and seek out answers about how to handle this tough situation. This may be a good time to get your leadership team involved to come up with a church-wide plan. If you’re on the leadership team, talk to others and ask them to commit to pray with you. Pray specifically. Ask God to enable you to effectively minister to each man and family by name. Ask the Lord to help the mom stay committed to raising her family in faith, and for Him to soften the husband’s heart. If you’ve ever gone to church solo with kids, you know that it feels like a three ring circus. A three-year-old dancing in the aisles may be objectively funny, but it is embarrassing when it is your three-year-old. So one of the best ways to minister to a mom who’s at church alone with her kids is to simply help her. If you see her struggling to keep up with all her kids or balance all her stuff, step up and help. Heck, help even if you don’t see her struggling. Yes, it may be a bit awkward at first. This lady just got herself and other tiny humans to church by herself. She basically deserves a trophy because that alone is tough. She’s probably not used to receiving a lot of help, so she may resist. Just ease the burden as much as you can. Ask if you can help carry a (or in my case a dozen) bags for her. Open the doors for her. Help her make plates at pot luck dinners. Save her a donut if she is running late. If your church doesn’t already have a parking lot ministry, now would be a good time to set one up. *A parking lot ministry is a fancy way of saying to have people in the parking lot on Sunday mornings. These are essentially greeters on the grounds. If you have a large campus, a golf cart will be helpful. The parking lot ministry greets people as soon as they get out of their car, directs them where they should go, and helps them get there. The number of people who drive onto a church parking lot and then leave before ever getting out of their car is quite staggering. Since you should be guarding your tongue in all situations, let this serve as a friendly reminder. Don’t joke about her husband not being there. Jokes do not lighten the mood. They make things awkward and uncomfortable. Your “joke” will stick with her and will replay in her mind the next time she is getting ready to come to church. Your “joke” may keep her from coming back. 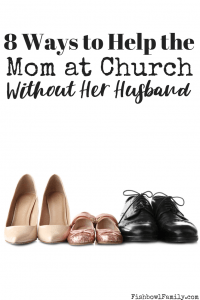 Don’t pressure her to get her husband to church. She is either at the point that she is still begging and nagging him to come with her or she is resolved to do it without him. Either way, you pressuring her at church won’t get him to come to church. No one likes coming into church alone. But she’s doing it for her and the children’s spiritual well being. She does not need you making a difficult thing harder. Be available to talk if she wants to, but don’t ask questions. What if her husband isn’t doing shift work and he’s just at home in bed on Sunday mornings? How will she feel having to explain that to you? If she does decide to confide in you, be sure to keep everything she says in the strictest confidence. She already feels very out of place, don’t make it worse by being nosey. Let church be her happy place where she can let her guard down. Do your best to make sure that she and her kids feel totally loved at church. Let church be the place that they walk in and let out a big sigh of relief because the pressure is off. They’ve made it to the building and this is their safe zone. Let her know how glad you are that they’re there. Tell them how excited you are to see them. In a non-creepy way of course. Offer to babysit the kids for a date night. Offer to meet her for coffee. Send her encouraging Facebook messages or texts throughout the week. Strive to really relate and build community with her. Find out what her needs are and try to meet them with love. Have your family “sponsor” her family and check out our post, 39 Ways to Serve Together as a Family, for ideas on how to serve them. Try sending home a devotional. 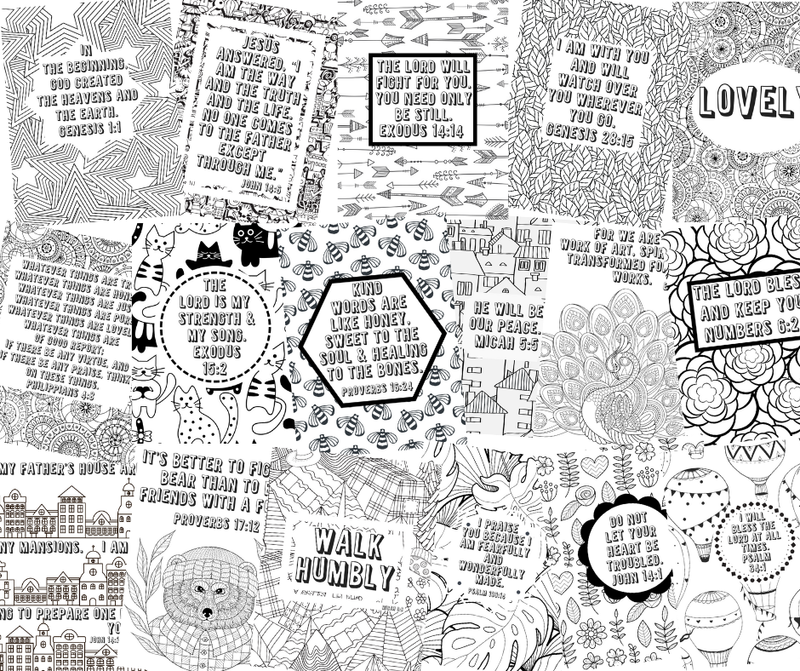 There are a ton of great devotionals to choose from. Which one you pick really depends on the person. You might try a husband and wife devotional or you might try one for just moms. I think the best way to do it is to have several available and on hand that are applicable to her current life and let her choose. If you think it would help, offer to do it with her as an accountability partner and set up daily or weekly times to chat about the readings. This post, How to Minister to the Woman at Church Without Her Husband, contains affiliate links for your convenience. 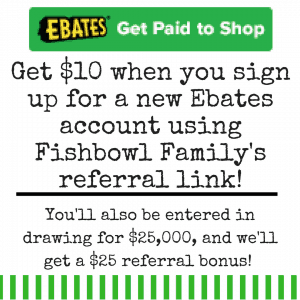 This means that if you make a purchase through our link, we’ll receive compensation at no additional cost to you. Read our full disclosure policy. You can also check out our post about The Best Devotionals for Moms in the Trenches of Motherhood for some great devotional ideas. If you’ve ever walked into a room full of people and not had a place to sit, you know how bad that can feel. Imagine doing that a couple of Sundays in a row after the stress of getting you and your kids to church alone. If that were me, I’d probably stop coming. A really simple solution to this problem is to just save a seat for the mom coming to church without her husband. And y’all, I’m going to tell you right now, it is okay to be over the top. It’s okay to be soooo excited to see her! It’s okay to wave big and let your “bat wings” flop. It’s okay to hug her like it’s been 7 years since you last saw her instead of 7 days. They like feeling special and welcome, and too often, we try to act cool and be low key about how happy we are to see people in church. You have kids and a job and need caffeine to function in the morning and think 8 pm is way too late to go out. Be over the top and let her know that you are genuinely excited to see her, and that you saved a seat for her right beside you. Have activities for the spouse to attend outside of a regular Sunday morning service. A date night where the church provides free childcare. A date night where the church provides free childcare and free dinner and free entertainment. A talent show/choir special for their kids to perform in. Often times, when people are hesitant to come to church, the toughest part is getting them through the door. Remember that God is working in that family and be faithful to follow His lead. If you can get them to meet other church members and see that they’re not weirdos or that the church is a nonjudgmental place, they’ll be much more likely to come back on a Sunday morning. If nothing else, getting them on campus will probably help them to see why their wife and kids love coming so much. In conclusion, helping women who are coming to church without their spouses can be tough. It can feel like navigating a minefield, but it doesn’t have to. Love her, love her kids, love her husband. Pray for them and help in any way that you can. What ways have you found to minister to the woman at church without her husband? Tell us in the comments!